With the end of the group stage of the World Cup we’ve lost half of the teams and it’s time to update our predictions. The biggest shock of the Group Stages was obviously the elimination of the current World Champions Germany. 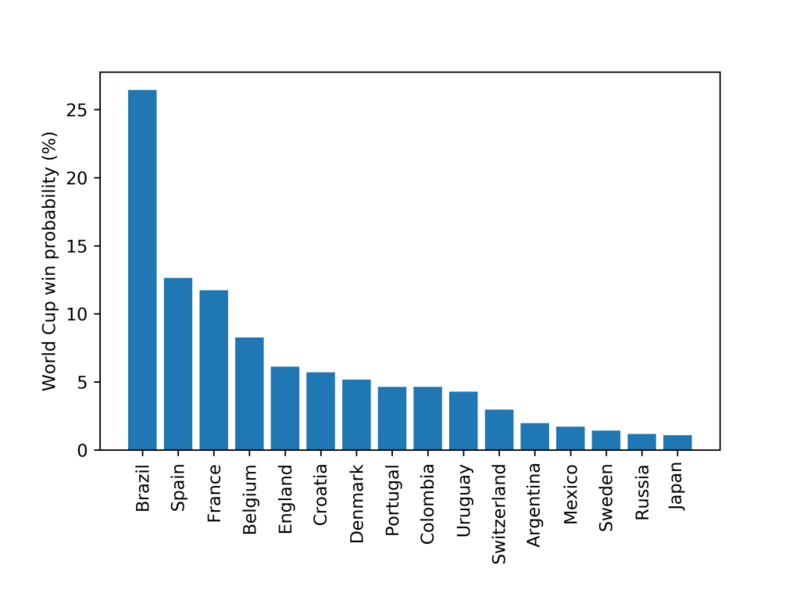 Before the tournament started my model gave Germany approximately a 10% chance of winning the tournament so that is (obviously) the biggest change between my pre-tournament and current predictions. 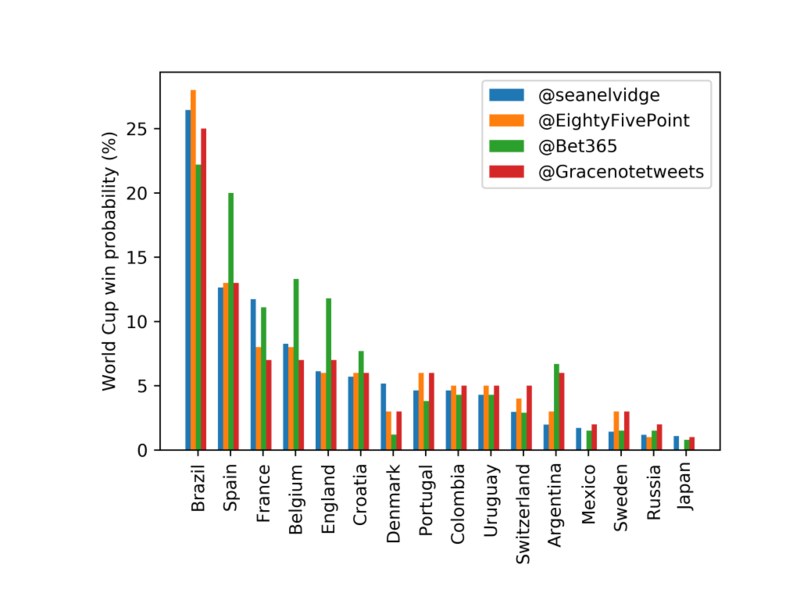 The model still not only predicts Brazil has the greatest chance of winning the World Cup, but it gives them 5% more chance than before the tournament started. 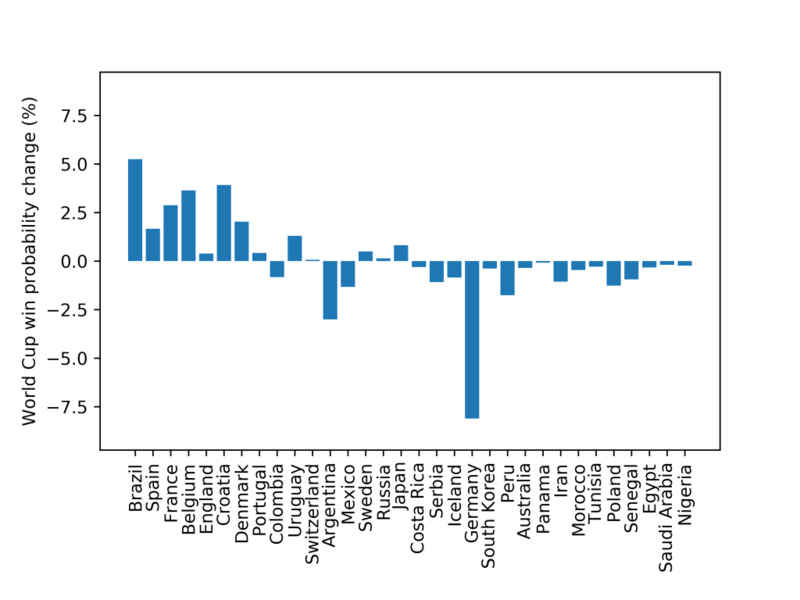 Belgium and Croatia also have sizeable increases in probability. Whilst England’s chances haven’t changed much since the start of the tournament, by the changing of others the model now sees them as 5th favourite for the tournament. As I’ve said in my previous posts model validation is very important. Is there any reason you should trust this model at all? The updated Brier score (which I describe here) for the model is 0.554, however the Bookies Brier score is down to 0.541 so the model is doing slightly worse than the Bookies (which is not surprising!). But still pretty good, all things considered (I am separately also predicting each of the results of the tournament and the Brier score for my prediction is 0.627, much worse!). As per my original post on World Cup models, there are a huge number of other models out their. The plot below compares the updated predictions of myself, EightyFivePoints, Gracenote and bet365. The three models which are not Bet365 you can see give very similar results. Since they are all based on the Elo rating system that isn’t surprising. But the differences were more obvious before the Group Stages started. 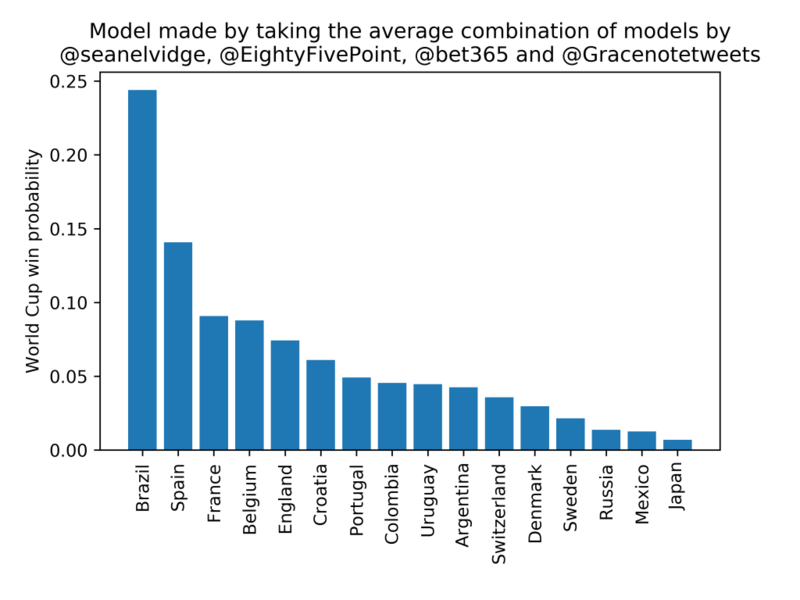 Bet365 gives larger odds to Spain, Belgium and England to win the World Cup than the other models would suggest. Gracenote and Bet365 also give a much larger chance to Argentina than EightyFivePoints or I do. This entry was posted in Football, Mathematics and tagged football, predictions, statistics, world cup. Bookmark the permalink.